We understand the chess game is a 'tough' game. Sometimes people are bored with chess pieces are always the same, brown and black. Then that needs to make chess pieces with different colors than regular chess pieces. We try to lock the fresh look into our chess pieces and bring them for you. The Red chess pieces will give you a new sensation in your game. No more boring moment but more joyful in play chess game. 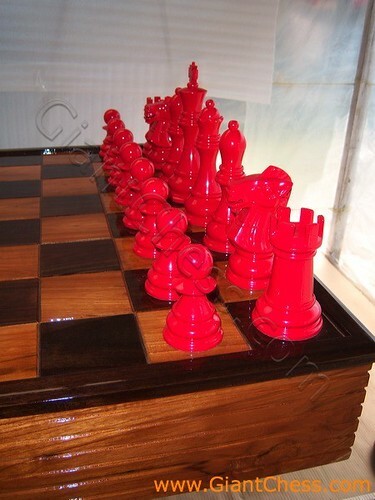 Those Red chess pieces are made from best Teak wood and carved by expert craftsman. Very different and unusual chess pieces which is a revolution of the usual chess pieces. Polished in bright red and stand on wooden board, make it looks attractive to play. Want to feel different chess game with your friend? Don't hesitate to order it!